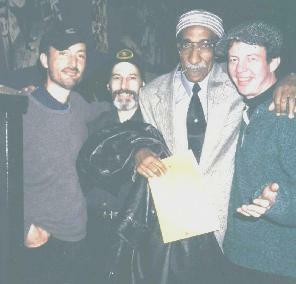 Larry, me, Charles and Arthur Williams, whose girlfriend, Joy, took this picture. 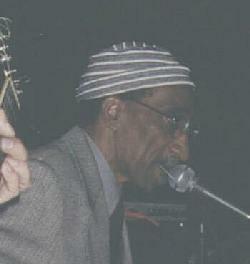 I first saw Charles Otis at Dan Lynch in 1979. He had a toothpick hanging out of his mouth. He was playing drums for Bill Dicey. 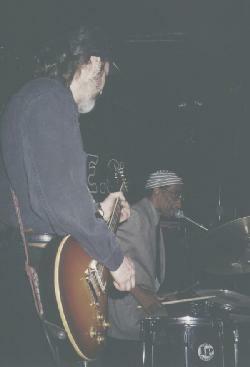 Sherman and Wendell Holmes were playing bass and guitar. They ruled the Sunday jam. Drummers would come down to watch Charles and observe his style. I've played gigs with Charles and it's just a pleasure to have him on drums and to back him up when he leads the band. Here's what Lenny Kunstadt had to say about Charles "Honey Boy" Otis: "Honey Boy has quite a history of recordings and performances which range from Fats Domino and Lionel Hampton to Chuck Berry, John Hammond, the Drifters, and the Coasters. He also hit charts as "The Honey Man", on Redbird Records with "Brother Bill (The Last Clean Shirt)," a tune he wrote with Lieber and Stoller which has also been recorded by the Animals, Bing Crosby and T-Bone Walker." Here are some pictures from our April 13th gig at Chicago Blues. Unfortunately I didn't bring my tape recorder and Larry didn't bring his digital camera. Luckily Arthur and Joy were there to take pictures when Charles walked in and, after repeated appeals from all present, sat in with us and brought the house down. 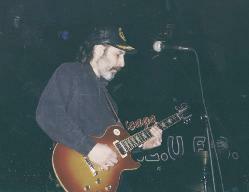 My old Les Paul. The famous toothpick.